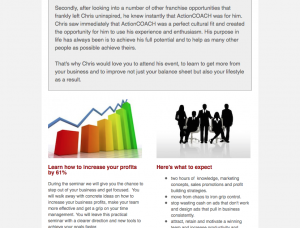 Chris Henry is an ActionCOACH Franchise Partner. Chris has his own website developed and needed content and images to promote what he does for business owners in Yorkshire. He also requires email campaigns to be designed and sent out to his database, in order to get attendees to his events. Created content and sourced images for the website. Added a ‘Coaching Solution Tool’ similar to the one I did for Tim Rylatt – a simple form that visitors use to learn which coaching solution they need depending on their situation and challenges. The results also show the specific benefits they will get depending on what they select. Free tools and resources section to encourage visitors to enter their email address which are then added to Chris’ email campaigns system. E-newsletters promoting events and workshops with follow-up campaigns. PDFs for Chris’ events to send out to his database. Chris now has a website that promotes him as an expert in his field and the first campaign and follow-up I did for him got 24 people book to attend the event from which Chris got 3 diags and a 1-to-1 coaching client so far and another is set to convert in January. The lifetime value of each new client can be £thousands which means a good return on your investment with me. This is from one event email campaign with a follow-up/reminder. It goes to show how important it is to keep the right communications going with your prospects and that’s what I can do for you.